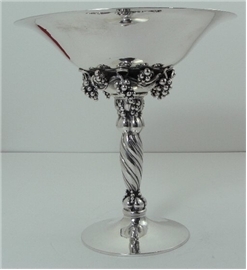 Beautiful Georg Jensen compote with grape clusters that hang under flaring circular bowl (7 1/8") and above twisted stem that stands on a circular base. The weight is 17.1 Troy ounces and the height is 7 3/8". The marks under the base are crowned George Jensen, 263B and GI 925. (see photos). 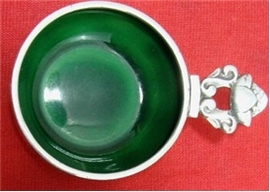 OPEN SALT ,Green Enameled, 3"